‘Tis the season for giving, and if you’re running a nonprofit organization or fundraiser this may be your busiest time of year for donations. Fortunately, it’s never been easier to add a donate button and accept donations directly through your website, and there are lots of different ways to do it. First, let’s talk about the dreaded transaction fees. Nowadays it’s standard for donors to make donations via credit card. But this means that you’re going to have to deal with credit card processing fees. This may seem like highway robbery, but one way to think about it is that by accepting credit cards, you’ll likely get more donations than you would without it, which makes up for the added fees. If you stick with the big companies (PayPal and Stripe, for example), you’ll pay a lower rate than if you use an online fundraising tool, but you won’t get as many features. (Check out NerdWallet for a more recent comparison of transaction fees). Be sure to ask if they give discounts for nonprofit organizations. Many payment processors will give you a break on fees if you can demonstrate that you are a registered nonprofit organization or charity. No matter what option you choose, you can be comfortable knowing that Jimdo never takes a transaction fee from any of the sales or donations on your website. Using one of the big payment processors to take donations comes with a few advantages. They have the lowest rates, they have trusted brands that people recognize, and many people already have accounts with them so that’s one less step to deal with. On the other hand, they have fewer customization options. They also weren’t built with nonprofit donations in mind, so it’s harder to set up recurring donations, suggested donation amounts, or use other charity-specific payment features. PayPal is by far the most popular option. They have low processing rates (registered nonprofits can apply for a special discount on processing fees, 2.2% + $.30 per transaction)vand their widget is incredibly easy to add to your website. Donors don’t need to have a PayPal account, either—they can check out as a guest with a credit or debit card. On the downside, it’s a little complicated to create a recurring payment option with PayPal. The button itself is totally recognizable, but looks a bit dated and might clash with the style of your website. Tip: If you’re a Powr.io user, you can embed a customizable PayPal button in just a few steps using our Add-ons feature. Stripe also offers reduced fees to nonprofits (2.2% + $0.30 for non-American Express transactions) and you can set up a subscription option that acts like a recurring gift. 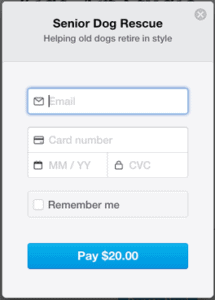 Stripe probably has one of the nicest checkout flows compared to PayPal. With Stripe, you can do more than just install a button. You can put the entire payment widget right on your web page, so people don’t have to leave your site at all. Remember, if you’re not a registered nonprofit, you can still use PayPal or Stripe for personal fundraisers—you’ll just have to pay the normal transaction fees. For more on Stripe vs. PayPal, check out this post from Memberful. You can also collect donations on your website with Store Item Elements. With the Jimdo e-commerce tools, you can accept payment via check or PayPal. JimdoBusiness subscribers can also accept Stripe. Here’s more information about how payment options work in your Jimdo online store. If you are selling t-shirts, mugs, or other swag to raise money, you would set up your items just like you would any normal store product. Another option is to create other kinds of intangible “products” that people can purchase as donations, and describe how they will contribute to the cause (see the example below). In this case, you would also indicate in your Store Item Element options that the item cannot be shipped so that your customers won’t be charged shipping. Your donors would add the “item” to their cart and proceed through your normal store checkout process to make their donation. Here’s an example of how you can use a Store Item Element to take a donation on your website. You can also use Product Variations in Store Item Elements to offer multiple donation levels. To do this, just open your Store Item Element and choose +Add Variation. Donors will then select their level from the drop-down menu. Use Product Variations to add more donation levels. Tip: If you want to go a step further and change the text of your button from “Add to Cart” to “Donate,” go to your menu and select Store > Settings and scroll down to Button Text. With the success of Kickstarter and other crowdfunding tools, online fundraising tools are booming. These services have higher transaction fees, but they also provide more customization options for your embeddable donation buttons and more tools to help you keep track of your donor lists. In other words, they provide more of a “nonprofit dashboard” than you would get from services like PayPal or Stripe. Another advantage is that they integrate with your social media and emailing services. Online fundraising services are usually free to sign up for and do not have a monthly fee. You’ll typically pay a service fee for each donation in addition to the payment processing fees. Note: Many of these services still depend on PayPal or Stripe as their payment processors, so if you’re trying to avoid PayPal, look closely at the fine print. If you go with one of these companies, make sure you aren’t paying for too many features you won’t use. For example, in most cases, they provide some sort of landing page on their website, so if you already have your own website that might be a bit redundant. That said, they can have some cool features specifically built for online fundraisers. Three options that we like in the Jimdo Support Team are Razoo, Fundly, and DonorBox, but there are many others that can work with your particular language and country. If you’re unsure, contact Jimdo Support in your language and they can make a recommendation. One cool thing about Razoo is that you can sign up to take donations for your own personal cause (going to your own bank account via Stripe) or to one of the thousands of existing charities. Razoo charges 4.9% per donation, plus the Stripe fees. It can accept international donations, but in USD only. DonorBox stands out from other services because their service is free if you accept less than $1000/month in donations (you still have to pay the Stripe processing fee, though), and 0.89% for donations over $1000/month. Another plus is that donation forms can be localized in different languages and can accept multiple currencies. Fundly is popular for nonprofits and people who just want to raise money for their own personal “causes,” like that trip to Brazil you’ve been dreaming about. Fundly charges a 4.9% fee on each donation + payment processing fee. Right now Fundly is available in the US only. It’s also worth checking out when and how these services deposit funds into your account. Fundly sends you your money in 24-48 hours, Razoo pays out on the 10th of every month, and Donorbox says that it gives you immediate access to your funds. No matter which service you choose, you’ll start by opening an account with them and adjusting your settings there. They’ll usually walk you through a few options: naming your campaign, specifying which fields you want donors to fill out, choosing your colors if possible. At the end, they’ll create some HTML embed code for you. The donation/payment website will provide you with some code after you fill out your settings. Copy this code and then return to your Jimdo website. Add a Widget/HTML Element where you want the button or checkout form to appear. Then, paste the code and hit Save. Voila! The donate button you’ve created will appear. Add a Widget/HTML Element to your Jimdo website, then paste in your code. Once you paste it into your website, if you want to change any options you’ll have to return to your PayPal or other account and adjust the settings there. Then recopy the adjusted code, and re-paste it into the Widget/HTML Element on your website. As you can see, there are plenty of ways to take donations through your Jimdo nonprofit website. 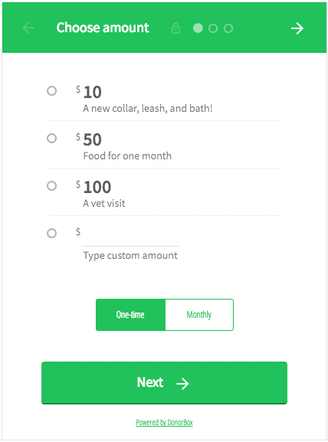 The option you pick will depend on the amount you’re hoping to raise, the extra features you’d like to have, and which embeddable donation form or button you like the best. Any other options you’ve used on your website that you’d suggest to other readers? Let us know in the comments.